The Surface Studio 2 recently launched at the tail end of 2018, packed with 7th-generation Kaby Lake laptop chips and high-end Nvidia Pascal graphics. It’s designed first and foremost for digital artists and illustrators, and the price tag reflects that. But, 7th-generation laptop chips are already looking long in the tooth, with the advent of Coffee Lake and the upcoming 9th-generation Intel laptop chips, so the Surface Studio 2 is arguably out of date. So, we’re left wondering: what will the Surface Studio 3 look like? Now, we’re not expecting any hard information to surface about the new Studio, especially since the Surface Studio 2 is still new. But, we can still craft a sort of wish list, right? So, be sure to keep this page bookmarked, and we’ll keep it updated with all the latest news and rumors as they arrive. We’re just going to come right out and say it: you probably shouldn’t expect to see the Surface Studio 2 any time soon. The original Surface Studio is more than two years old now, launching in December 2016, with the Surface Studio 2 following in November 2018. Just based off of these two releases, we can assume we won’t see the Surface Studio 3 until the end of 2020. Both the Surface Studio and its sequel are expensive computers. Both represent a massive expense for artists. And, it would be safe to expect the Surface Studio 3 to be at least as expensive. The Surface Studio 2 already bumped the price up by $500 (AU$800, about £390) over the $2,999 (AU$4,699, about £2,390) original, setting users back $3,499 (AU$5,499, about £2,720). If Microsoft does decide to hike the price further, we just hope it means that the Surface Studio 3 is packed with some more up to date hardware upon release. The Surface Studio 3 is already an incredibly niche product, so it’s kind of hard to draw comparisons to existing devices to try and create a wish list. 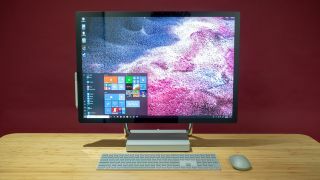 But, because we here at TechRadar don’t believe a perfect product exists, here’s what we want to see in the Surface Studio 3 if and when it comes to market. We get it, Microsoft: you don’t want to pay Intel’s license to use the Thunderbolt 3 standard. It makes sense, but there’s only one problem: everyone else is doing it. There are so many storage drives, monitors and other accessories that rely on Thunderbolt 3 to get the job done, and this is especially true for professional products. By 2020, when we’re likely going to see Thunderbolt 3 on flash drives, it will be all but essential. The Surface Studio 2 already has the USB-C port – it just needs to go that step forward. For a device that wants to take center stage in the professional artist’s setup, the lack of Thunderbolt 3 – especially at this price point – is inexcusable. To put things into perspective real quick, the Surface Studio 2 launched in November 2018 with Nvidia 10-series graphics and Intel Kaby Lake processors. The Pascal graphics are understandable – Nvidia didn’t announce mobile-class RTX graphics until CES 2019. But, Intel launched Coffee Lake H-series mobile processors way back in April 2018 – more than six months before the Surface Studio 2 hit the streets. We’re not saying that the Kaby Lake chips aren’t going to get the job done, they will – but, Coffee Lake processors would get the job done faster. Is it too much to ask for an up-to-date processor, though? We aren’t sure which “Lake” Intel will be on in late 2020, but, Microsoft: please include the latest processor. Because, if you’re forking over thousands for a computer, you deserve up-to-date hardware. Not to say that the Surface Studio 2’s display isn’t high-resolution enough, but why stop at 4,500 x 3,000 pixels? We feel like monitors such as the Dell UltraSharp UP3218K are only going to become more common – especially among creatives. So, we’d like to see the Surface Studio 3 take screen resolution to a whole new level. We’re not saying go straight to 8K, but maybe we could see something in between – outclass that iMac Pro display to make it a better sell to would-be Apple converts. At the end of the day, no one knows what the Surface Studio 3 is going to look like. But, keep it locked to this page, and if we hear anything, we’ll update this article.